SeeClickFix CEO Ben Berkowitz at Gov20LA from Gov20LA on Vimeo. I rounded the first corner with brand new pothole in sight. As I was about to pull out the SeeClickFix app on my phone and report...the New Haven Public Works truck rounds the corner. Two guys jump out of the truck and patch the hole. As I'm getting ready to report I see Michael Jones, Newly appointed Ward 1 Alderman and newly appointed SeeClickFix Watcher. He is a would be recipient of the report I'm about to make. I talk to the alder on the side of the road. 30 seconds in he starts to smile and says "looks like you're too late." I turn around and my pothole is literally being filled as we speak. I ask the guys if they're going to get to my potholes on Mechanic Street, "There on the list." Mike asks about the really bad one on High Street, "Filled 5 minutes ago"
I'm now back in the office retired to writing blog posts about people filling potholes as opposed to reporting them. Here's to Good Government beating good government gadgets to the punch. 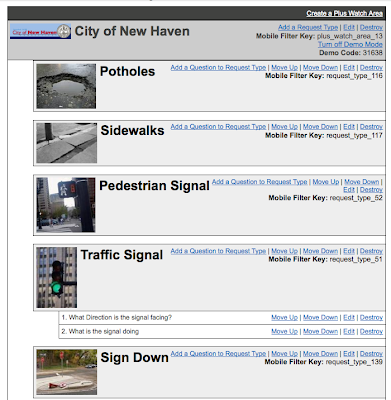 Keep up the good work NHV Public Works! Yale Sophomore Brian Tang has worked his way to the top of New Haven's SeeClickFixing order. He's earned 8685 civic points, commented 405 times, reported on 85 issues, and closed 26 issues (as of 11 AM on Feb 25). But he's not stopping there. 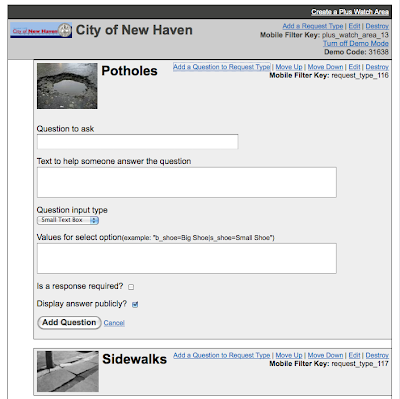 Just this week he launched a SeeClickFix oriented column on Scene, the Yale Daily News blog. Tang will use the column to document "some of the most egregious nuisances he's noticed around Yale's campus." Tang's column urges his readers to support the issue on SeeClickFix after reading the article. We look forward to reading Tang's future installments. We've already appreciated his SCF posts, which often go beyond a simple report of an issue to advocate for better public transportation, keep citizens apprised of the city's latest plans, or show-off some cool multi-media. Check out the 3D animation he made to encourage the city to create a cycling track on a downtown New Haven street. Love is in the air–and in the streets–as SeeClickFix helps mend broken hearts in Tucson (like the one above). Less than a month after we designed a SeeClickFix Plus custom smart-phone app for the city, citizens and city workers have fallen for the service. Tucson residents have already used it to report 83 repair requests. According to an article in the Arizona Daily Star, the service "is proving so popular that city work crews are devoting two days a week - Mondays and Fridays - to patching potholes reported in this manner." The affection on behalf of the city workers makes sense. SCF is an inexpensive method for cash strapped road-repair offices to target the largest and most hazardous potholes first. While the honeymoon period is not yet over, SCF hopes that the relationship with Tucson will grow and mature into something wonderful. Minnesota Public Radio became one of the first radio stations to partner with SeeClickFix after debuting this stylish map widget on their site yesterday. 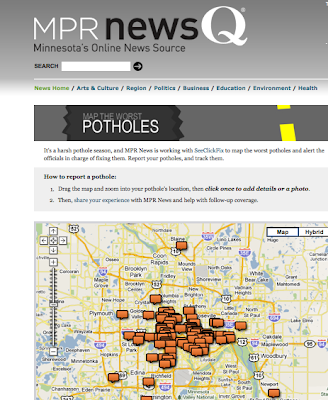 "As we've noted recently, the pothole problem is one of the worst we've seen in Minnesota in many years. Part of it is because of the weather, part of it is because cash-strapped cities patched roads last year that otherwise might've been resurfaced. Whatever the reason, driving in the state right now is something only a front-end realignment shop could love." From Jersey to Minnesota, this pothole season is taking no prisoners. Luckily SCF is around to help out. 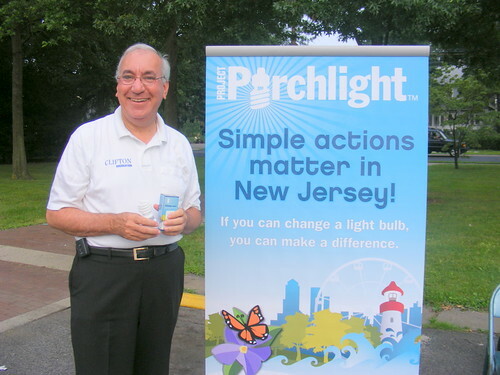 James Anzaldi, the mayor of Clifton, NJ, has made his town's government a bit more transparent through his use of SeeClickFix. 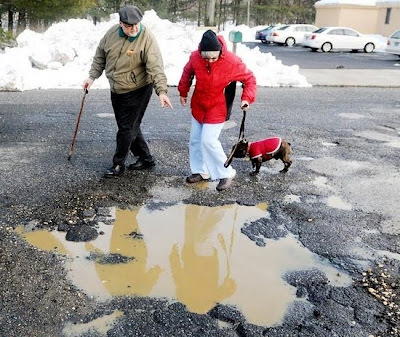 He's been using SCF to tackle North Jersey's annual pothole epidemic, by directing issues to the appropriate officials and by letting his constituents know that they're being taken care of. You'll recognize his comments by his trademark sign-off– "Mayor Jim"
Next time you're walking down the street, don't be surprised to catch someone whipping out their phone to report an issue. Little brother just got a few thousand more eyes. Is that a Pothole or a Pond? The Daily Journal, a paper covering South Jersey, has been combating monster potholes (like the one seen above) with its SCF Road Patrol Widget since December. Just today they wrote a great article about how SCF is helping overwhelmed and overworked local Public Works departments efficiently target pressing issues. "I only have 16 people working it and there's 27,000 people here driving around," said Tom Walkup, Millville's public works director. "We're grateful for anything legitimate that's brought to our attention." 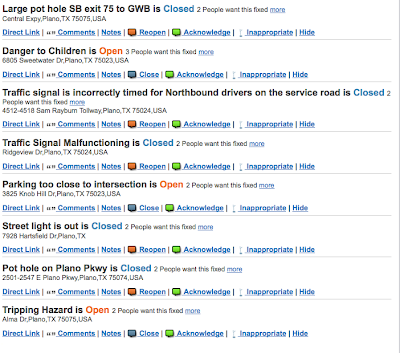 The B'more SeeClickFix community has been humming the past couple days with the addition of the Sun's new pothole tracking widget. Click here to check it out. 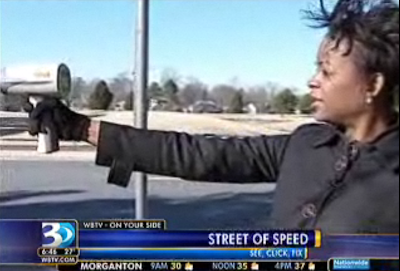 When in Charlotte, Go Slow. 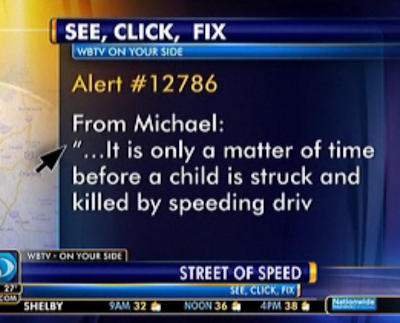 Kudos to Charlotte, North Carolina's Channel 3 News. The station not only posted our map widget to their website, but added a soon-to-be-regular "See Click Fix" segment to its 6 o' clock news lineup. News Anchor Christine Nelson urged her viewers to report issues "big or small, whatever the case may be. We will step in and help get it fixed. All it takes is the click of a mouse." Nelson might just be the next SeeClickFix superstar. After reading an SCF report about chronic speeding in a residential neighborhood, she took to the Charlotte streets to investigate herself. 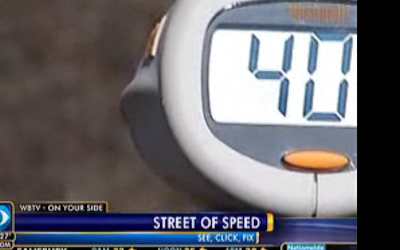 Armed with a radar gun, she caught cars doing 40 in a 25 MPH zone. Then she paid a visit to local police to discuss fixing the problem. Thanks again, Charlotte. We look forward to seeing what other SCF stories Nelson will launch into TV stardom. Not long ago, the City of Tucson opened a SeeClickFix Plus account to help make their city services more transparent, more efficient, and more accessible to their citizens. They got a spiffy new customized app for iPhones, Blackberries, and Android phones and an optimized system for monitoring and directing SeeClickFix issues to their employees. And they've been loving it! There used to be four links in the chain between the citizen who reported an issue and the employee who went out to fix it; now the two are directly in touch with each other. As you can read in one of our earlier posts on Tucson, the system has been cheaper for the City. Money that had previously been spent on overhead costs is now spent directly on solving the citizens' problems—a fact that bears particular importance in this period of budget shortfalls and service cuts. Now, a second wave of organizations is beginning to embrace SeeClickFix in Tucson. After implementing SeeClickFix on the metropolitan level, the City has been encouraging community organizations to utilize our tools on a local level as well. Earlier this month, a newsletter was sent out to 35 neighborhood associations—in Ward 3 alone—encouraging them to make use of SeeClickFix services. Community organizations of all sizes have been making watch areas for themselves and embedding widgets on their web sites. The way Tucson has embraced SeeClickFix services showcases the beauty of distributed 311 and scalable solutions. Local problems will find straightforward fixes from those who know the area best, and the different levels of authority within the city government can work together more efficiently. After weeks of lively debate and a total of 11 hours of public testimony, designs for the Yale School of Management’s new campus have made it to the next step of the approval process. The Board of Aldermen is expected to make a decision on March 1 about whether the plans can move forward. Like all city projects, the building process included a mandatory 120 days of public commentary, and both Yale and the Board of Aldermen have made an effort to take public opinion into account throughout the design process. Even before the first public hearing, Yale asked the firm Foster + Partners to redesign the campus in response to a petition signed by twenty residents of the neighborhood surrounding the development site. The petition expressed concerns that new structures would abut residential buildings too closely and that the contemporary glass-and-steel-aesthetic would negatively affect the neighborhood’s look and feel. In addition to the redesign requested by Yale, the Board of Aldermen added three amendments of their own to the proposal, including one which would require that a campus walkway be open to the public. Despite the numerous modifications, supporters of the project remain concerned that opposition from a small number of residents would ultimately lead to a compromised final product that none of the parties involved would really be satisfied with. Where does SeeClickFix fit into this picture? Opponents of the project have been active and vocal, whereas supporters in the community—who are probably more numerous—have been much less well-organized. However, two days before the second public hearing was scheduled to take place, Ben posted it as an issue on SeeClickFix and asked members of the community to express their support. By the time of the hearing, more than 130 people had responded to his call and registered their opinion that the project should move forward. The ticket remains open for comment and the number of supporters continues to grow. On March 1st the Board of Aldermen will look to the ticket as a show of public support, but in the meantime it will continue to foster the debate and keep citizens engaged. We're glad that to see that SeeClickFix has been so successful in bringing public debate out of city hall and into the cloud, where anyone can plug in and be heard at any time. 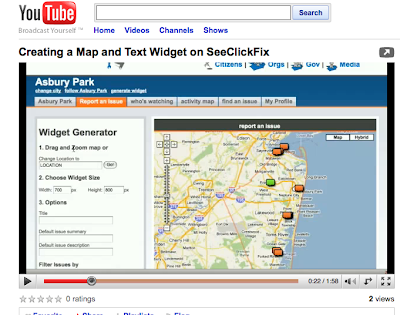 We just uploaded a YouTube video demonstrating how simple and quick it is to set up our map and text widgets for any web site. Check it out here. definition of geo·dy·nam·ic: Characterized by constant change, activity, or progress depending on and specific to the place or geographic location. Available for Blackberry, iPhone, and Android, our geodynamic apps will look and behave differently depending on where a smart phone user happens to be. If you open the app in Manor, Texas, for example, it will appear tricked out in Manor's custom logo, colors, and menus. This is a useful shortcut for local governments, who otherwise would have to shell out the cash to develop and maintain their own smart phones apps. Big cities, like Boston and Pittsburgh who've already developed custom apps, can afford this, but many smaller municipalities simply don't have the resources. That's why smaller towns like Hillsborough, CA and Bainbridge Island, WA have been among our first customers. Our smart phone apps have the potential to bring the accessibility and convenience of a custom app to every municipality in the world. Make your town next. Sure–Twitter and Facebook are great sites for social networking. But they lack the intimacy that comes with piling into a saloon and throwing back $2 dollar drinks with like-minded people. So come to the first ever New Media Haven, a networking happy hour for "social media geeks," "creatives," and "techies," on Monday, February 15th from 6-8. It's at the Black Bear Saloon on 124 Temple Street, in downtown New Haven. SeeClickFix CEO Ben Berkowitz is the featured guest and will be presenting on all the exciting things happening at SCF, including our new geodynamic smartphone apps. Today kicks off the SeeClickFix Challenge on the SmarterCities blog, "a collaborative intelligence project for building a planet of smarter cities." For the next two weeks, SmarterCities is asking everyone in the SeeClickFix community to post their experiences using the site. Success stories, suggestions, frustrations, or points of clarification--the idea is to create a forum for our users to strenghthen networks within SCF communities and generate dialogue about the future needs of our users. New Haven Independent Editor Paul Bass has already contributed. As has Dustin Haisler from the City of Manor, Texas, and two fixers in Germany! Visit the submissions page of the SmarterCities Tumblr Site. Post your SCF stories in the box that says "Post"
We look forward to reading your stories soon. The SCF Challenge ends February 21. Check out the custom widget that Philly.com generated so that residents of the City of Brotherly Love can make sure their streets get plowed. SCF's Philly community has been buzzing all day, as fixers around the city continue to fill up their watch areas with locations in need of plowing. SCF wishes the best of luck to all our users in Philly, as they brave their city's second biggest blizzard on record! SCF users described the intersection of U Street and Florida Avenue in the Adams Morgan neighborhood as “a serious safety hazard” and a “tragedy waiting to happen.” Representatives from the local city councilman’s office immediately responded, with information on a streetscape reconstruction project that was set to target this intersection. Through continued dialogue, citizens were able to convince the DC Department of Transportation that this intersection deserved interim action. And just last week, the DDOT used SCF to publish a list of completed fixes, including new signs, road lines, and signal timings. City Fix DC points out that that more repairs are still needed and will be handled by the long-term plan. However, the DDOT’s quick response to the unexpected problem shows the power of the SCF community to prompt action to issues that need to be addressed more rapidly than the timeframes set by long-term planning goals. Check out other DC Success Stories Here. Tools or by searching for "seeclickfix". 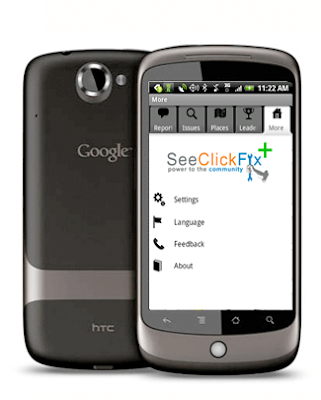 send feedback or bug reports to support@seeclickfix.com . Though NYC is not our home, it is our closest big city home so we felt really welcomed by the croud at NYC Tech Meet-Up last and Scott and Dawn. A big thanks to Alain from the Latters who got us on the bill and Andrew Rasiej who asked the question of the moment, "What do we have to do to make this work in NYC?" The answer - Ask NYC 311 to use it. Also, a huge shout-out to our mystery NYC Public Servant (Civil Servant on SCF) who was thanked last night for fixing citizens issue reported on the site.